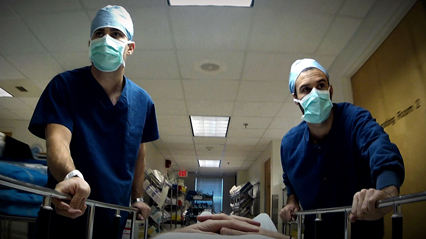 The next US Documentary Competition title in my profe of the upcoming Sundance doc slate: ESCAPE FIRE: THE FIGHT TO RESCUE AMERICAN HEALTHCARE, Matthew Heineman and Susan Froemke’s far-reaching exploration of the US healthcare system. Our healthcare system is broken. Potent forces fight to maintain the status quo in a medical industry created for quick fixes, rather than prevention; for profit-driven, rather than patient-driven, care. Healthcare is at the center of an intense political firestorm in our nation’s capitol. But the current battle over cost and access does not ultimately address the root of the problem: we have a disease-care system, not a healthcare one. After decades of opposition, a movement to introduce innovative high-touch, low-cost methods of prevention and healing is finally gaining ground. With consummate skill, filmmakers Matthew Heineman and Susan Froemke interweave dramatic personal stories with the efforts of leaders battling to transform healthcare at the highest levels of medicine, industry, government, and even the U.S. military. Destined to be hailed as the definitive film on American healthcare, ESCAPE FIRE offers a way out—a primer on how to save the health of a nation. Heineman worked with Froemke on HBO’s Emmy-nominated series THE ALZHEIMER’S PROJECT. His first feature doc, OUR TIME (2009), received its broadcast premiere on the Documentary Channel last year. Froemke’s filmmaking career spans four decades and dozens of documentaries. She worked with the legendary Al and David Maysles on several projects, including the classic GREY GARDENS. She’s no stranger to Park City – CHRISTO IN PARIS (1990) and LALEE’S KIN (2001) have screened at the festival before. The latter received an Oscar nomination, adding to Froemke’s professional accolades, which include four Emmy Awards and a Grammy Award. Froemke’s pedigree should be impressive enough, but the project benefits from the creative partnership of the veteran documentarian with the emerging filmmaker. Together, they cover a lot of ground for what is clearly a huge issue – one of several tackled by docs at the festival this year. Despite the immensity of the topic, the filmmakers offer viewers a clear and determined solutions-oriented approach that clarifies the institutional deficiencies in America’s healthcare system and provides an inspirational way forward. The doc’s Facebook page may be found here. Froemke and Heineman discuss their doc in a “Meet the Artists” interview for Sundance here, and with Indiewire here. A teaser trailer may be found here. The filmmakers are also currently running an Indiegogo campaign for postproduction financing. For screening dates and times at Sundance, click the link in the first paragraph.